This post is part of a series on Saving for College— read about getting started with a 529 account and superfunding your 529 for more. You already know the cost of college is rising: It increased 3.6% last year, nearly double the rate of inflation. What you might not know? It’ll cost an estimated $302,700 to send today’s newborns to a four-year private college, according to Wealthfront research. To cover that amount, you’d need to save $980 per month — for 18 years straight. Parents of younger kids: you might be thinking, “We’re focused on K-12 right now; college is so far away!” But the truth is, if you have children — or plan to — it’s never too early to start thinking about college. Below, a few Wealthfront parents share their perspective on the things you should contemplate now if you have kids who may be college-bound in the future. 1. Will you contribute to your child’s college education? There’s no right or wrong answer to this question; for many parents, their philosophy traces back to their own experiences. Whatever decision you make, the important thing is to think about it now (yes, even if your child is still sucking on a teething toy like it’s their job). Because, if you want to cover part or all of your children’s education, you need to start saving today. 2. If you plan to contribute, how will you save? Just as with retirement, the earlier you start, the better off you’ll be. The easiest way to save for college is with a 529 plan, an investment account created specifically for education expenses. Even small investments add up over time: saving $100 per month today could lead to $38,932 over 18 years, if you factor in 6% annual before-tax returns. Start five years later and that may drop to $23,664. 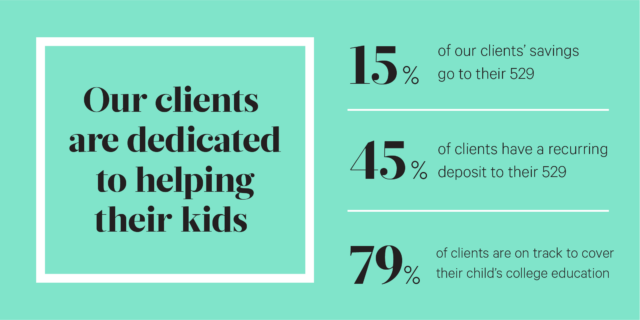 To see what your contributions would amount to, log into Wealthfront and our automated financial planning will perform a comprehensive analysis on your college savings plan. Another advantage of starting early? Throughout your children’s life, you can ask friends and family to contribute to their 529 plans — instead of buying birthday and holiday gifts they’ll forget a week later. 3. How will you balance saving for college alongside other goals? As a parent in this day and age, you’re probably battling several financial priorities: paying off debt, saving for a house, investing in retirement — and then also saving for your children’s education. It can be overwhelming to decide what to prioritize. All three are still thinking about retirement, too — and that’s a good thing. Although priorities are personal, there’s one thing most financial experts agree on: putting retirement investments above everything else. Because, while your kids might be able to land a scholarship or take out a loan for their education, retirement is something you have to save for without outside help. 4. When will you discuss your choice with your children? Whatever your plan, it’s vital to discuss it with your children when they enter high school — though you should start having money conversations long before that. If you expect your children to contribute to their college funds, talking to them early gives them ample opportunity to get a part-time job, or to focus on grades and extracurriculars that will make them more competitive for scholarships and grants. And, if your children plan to take out student loans, it’s imperative to discuss the financial implications. Most teenagers don’t understand that $39,400 in loans (the national average) could cost more than $400 per month after graduation. So, using a calculator like this, show them their monthly payments — and how they’d fit into a mock budget. While it can be tough to imagine your little ones someday heading to college, it’s vital you do. Early planning is one of the best gifts you can give your children.